Value-for-money refinement is the keynote of an extensive series of improvements announced today (Sunday June 3) for the world beating Range Rover. Top of the range is the Vogue - the most highly specified production Range Rover ever - the latest result of an intensive development programme which began with the launch of the award-winning 4-door version in 1981. The new across-the-range improvements will give additional impetus to sales which set all time records in the UK and Europe last year - a remarkable tribute to the charisma that Range Rover has aquired since its introduction fourteen years ago this month. Electronic ignition, a brand new fascia and instrument layout, reclining front seats, improved heating and ventilation, and one piece side windows are just a few of the latest improvements. Significant new options - standard on Vogue - are electronically operated windows and door mirrors, which are also heated; a four speaker stereophonic audio system; an ingenious luggage compartment cover and a tailgate-oprated courtecy light. Elegant new trim - Silver Grey or Bronze Check - and three new colours mean that the latest Range Rover is a stronger testimony than ever to the company's latest marketing theme 'luxury need not stop where adventure begins'. Despite these extensive changes, prices for the two and four-door standard versions are held at the current levels - a remarkable aspect of this latest stage in Range Rover's development. In the tradition of the vehicle, however, a wide range of options is available for 'tailoring' to individual customer requirements. Among many practical and visual improvements inside the vehicle, one of the most striking is the new fascia and instrument display. Standard on all models, it features a speedometer, tachometer, and a 15 light warning panel, all in a completely new binnacle, a front fuse panel, and a fascia mounted passenger grab handle. Switches and gauges have been extensively revised and repositioned to give massively improved visibility and ergonomics. Interior improvements also include new fresh air and side demisting vents. Heater performance has been boosted, and for the first time hot air is ducted to the rear passenger compartment. The new four-door specification brings multi-adjustable front seats to the Range Rover for the first time. Already acknowledged to provide armchair comfort over long distances, on or off the road, Range Rover's seats are now reclining and also have a height adjustment facility. For the first time in this class of vehicle, seat belts on four door versions have height adjustable shoulder straps, with anchorage points repositioned onto the 'B' post. New one piece side windows improve both appearance and visibility, enhanced by new aerodynamically efficient door mirrors. Both features help to reduce wind noise. The Vogue has stylish colour-keyed side stripes and grey alloy wheels to provide a distinctive extra touch. Always renowned for its massive luggage space, the latest Range Rover now incorporates an ingenious cover for the luggage area. The cover conceals and protects luggage, but to take adventage of the Range Rover's full gargo bay it can be removed and neatly stored at the rear. Special edition Range Rovers have carried the Vogue name in recent years with great success - but it is now applied to the top-of-the-range production version. The Vogue is the most luxurious Range Rover ever to come off Solihull's advenced manufacturing lines. 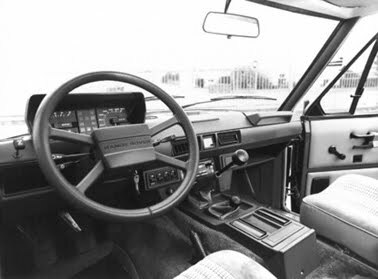 To the widely improved basic specification, the Vogue add the electric windows, the heated mirrors adjusted by remote control from the driver's seat, powerful jets to wash the quartz halogen headlights, the new luggage area cover, grey alloy wheels and the stereo radio cassette system. Stylish Silver Grey trim is exclusive to the Vogue. Many of the Vogue's features are optional on the standard four-door. Other options available on all or some versions are automatic transmission, air conditioning, a towing pack, and a heavy duty battery. Several of the range's most important changes may never be seen by Range Rover owners - but they will certainly be appreciated. For instance, Lucas electronic ignition is now fitted to the 3.5 litre V8 engine whose smooth flow of power and torque provides such superb performance on everything from city streets and motorways to brutal terrain in the most hostile corners of the world. Its ability to maintain tune enhances the power unit's long-term efficiency. Changing the instrument panel and switchgear provided an ideal opportunity to take a clean sheet of paper and design a new electrical harness, also in the interest of reliability. Sweeping changes are blended with features that have been fundamental to the Range Rover concept ever since the model's sensational debut in 1970. Among the most important are a steel chassis of immense strength, rust-free aluminium bodywork, beam axels with coil springs for standard-setting ride comfort and handling, permanent four-wheel drive, disc brakes for all wheels, and a magnificient light-alloy engine which develops 125 bhp (93.2 kW) and 190 lbf/ft (258 Nm) of torque. The five-speed manual transmission, introduced last year, and the optional automatic operate in conjunction with the two-range transfer box and a centre deifferential that can be locked to provide the ultimate in traction. Its classical, functional styling is another reason why the demand for Range Rovers keeps increasing. More than 12.000 were sold in 1983, when UK sales reached an all-time high of 2991. Records were also set in key European markets while other major export areas included Saudi Arabia and the United Arab Emirates. "Last year's success, and the fact that 1984's figures are even better, make it clear that the Range Rover is a unique vehicle," said Tim Ackerley, Marketing Director. "It stands supreme as the only four-wheel-drive vehicle with all the sttributes of a luxury car, and the only luxury car with all the attributes of the world's best four-wheel drive system." "The Range Rover has a tremendous capacity for very hard work, but typical customers tend to be people who would otherwise have bought another high-class high-performance saloon or estate." "The sweeping improvements announced today, like the very significant changes made since 1981, provide even more of the features fastidious people when they buy a luxury car." The world-beating Range Rover has always been renowned for providing a heady cocktail of style, strength, space, astonishing versatility and the rare ability to keep going in conditions where a camel or mountain goat would be more appropriate. Launched in 1970, it has carved itself a unique niche in the market of luxury cars. The wide-ranging improvements announced today, 3 June 1984, follow hard on the heels of record-breaking British and European sales in 1983. They make the Range Rover a more attractive proposition than ever. Drivers and passengers have always appreciated the Range Rover's spacious interior with its big windows, high-mounted seats and built-in safety features. A host of new features now make it more comfortable, practical and refined than ever. All models give the driver a new instrument binnacle with speedometer and trip meter, tachometer, fuel and water-temperature gauges, and a neat cluster of 15 warning lights. A rheostat provides adjustable illumination. Illuminated switches to the left of the steering coloumn operate the interior, hazard and rear fog lights, plus the rear-window heater, while a steering coloumn stalk controls the rear wash/wipe, fitted for the first time with an intermittent wipe facility. Other new up-front features include a 20-fuse panel, a new quartz clock mounted in the centre of the facia, demisting vents for theside windows, and moulded door trims with revised locations for the speakers and handles. Tucked away out of sight is the completely new, and simplified wiring harness whose thin-wall irradiated cables reduce bulk and provide more protection against abrasion and high temperatures. Multiway units have reduced the number of individual connections from 152 to 103 in the standard model, and the Lucas 28RA relays have a higher technical specification than the components they replace. All models also get a significantly improved heater which provides a better temperature balance between the footwell and the upper parts of the passenger compartment. Its characteristics are optimised in the four-door and Vogue models by ducting which pipes warm air along the transmission tunnel to the back-seat passengers. The classic Range Rover styling has been augmented by one-piece front windows for two and four-door models. (NB It's wrong regarding the one-piece windows for two door model, which stayed on with the original small vented windows) They improve visibility, particulaly of the door-mounted mirror, and reduce wind noise significantly. Noise levels are also cut by the adoption of aerodynamic mirrors. On top of the range Vogue, the mirrors have heating elements and remote control adjustment as standard. These are optional on other models. At the rear, the upper section of the two-piece tailgate is made easier to close by giving an 'over centre' action to the gas operated struts. Glass is cleaned by a wash/wipe which now has the additional convenience of an intermittent setting, and the tailgate operates a new courtesy-light switch. Tastefully colour-keyed exterior badging is another innovation. The two-door retains the traditional Range Rover front seats, but their counterparts in the four-door variants break new ground. Comfort is increased by additional support, fully-reclining backrests, height adjustment and a tilt facility for the cushion. An important innovation of this type of vehicle is that the seatbelts are now height adjustable to four positions with the anchorage points now on the 'B' post. The two-door, the four-door, plus option packs and the lavish Vogue combine to form a range aimed at a broad spectrum of requirements and resources. The line-up is a reminder that the Range Rover's uinque appeal has always extended from hard-working fleets to millionaires whose garahe is not complete without at least one world-beating 4 x 4 from Solihull. The privious top model's specification embraced such things as alloy wheels, central locking, metallic paint and rear seatbelts, but the Vogue makes it look almost spartan. Among its additional features are electric windows and mirrors, headlight pressure washers, brown wood trims for the doors, front and rear head rests, luxurious silver-grey cloth upholstery and a digital stereophonic audio system with four speakers. 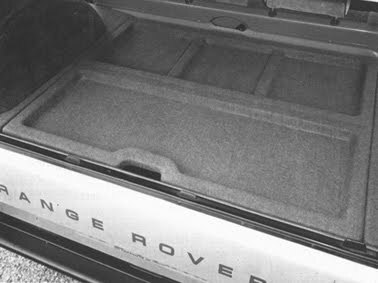 The Vogue is also the first Range Rover to be sold with factory-fitted cover for the luggage compartment for concealment and security. Rigid but hinged, it can be folded in seconds and slotted in neatly behind the tailgate. The core of the Range Rover design is a box-section steel chassis whose immense strength, proven in sevice throughout the world, is the main reason for the vehicle's extraordinary reliability and longevity. Engineers at Land Rover Ltd, backed by nearly 40 years of experience with 4 x 4 designs, remain convinced that there is no better way to build a vehicle with superb on-road and off-road performance. In fact the frame's strength and durability are so great that it is used, in suitably modified form, as the basis for the latest versions of the legendary Land Rover. Magnificent on motorways, dauntless in deserts, the Range Rover rides better than many high-priced conventional cars thanks to its remarkably refined and robust suspension. The long-travel system is controlled by hydraulic dampers and features beam axels, firmly located at front and rear with cil springs. The rear suspension layout is notable for the Boge Hydramat ride-levelling unit incorporated to cope with heavy loads and to assist towing performance. It consist of a gas-filled and oil-damped self-energising strut which automatically pumps itself up to compensate for increased weight. The strut maintains the normal ride height, leaving the coil springs with their vertical movement to absorb bumps. Both axels have the spiral-bevel differentials to handle the permanent four-wheel drive which is a great safety factor on ordinary roads, and essential for cross-country driving in the most literal sense. Adwest Varamatic power-assisted steering is now standard on all Range Rovers. Light, responsive and geared for 3.5 turns from lock to lock, it combines with the superb driving position and surprisingly compact overall dimentions to make the Range Rover remarkably easy to control. Very few vehicles inspire quite so much confidence in heavy traffic or handle so well on the open road. Stopping power is provided by servo-assisted disc brakes on all four wheels. The system has no difficulty coping with high speeds - Range Rover's have been independently tested at nearly 100 mph - and is equally competent in off-road water, mud and sand. It may be a luxurious five-seater with 36.2 cubic feet of luggage space, but the Range Rover's performance figures would have done credit to several stark two-seater sports cars not so many years ago. The mile-shrinking punch is smoothly and quietly delivered by a light-alloy, 3.5 litre V8 engine with five main bearings and self-adjusting hydraulic tappets. It produces an effortless 125 bhp (93.2 kW) at 4000 rpm and has 190 lbf/ft (258 Nm) of torque on tap at 2500 rpm. The latest Range Rovers have for the first time Lucas electronis ignition. Designed to maintain tune over very long periodes, the system also provides easier early morning starts. The five-speed LT77 gearbox introduced last summer works in conjunction with the LT230R transfer box to provide ten forward and two reverse gears - a ration to cope with any situation likely to encountered. High or low ranges are selected by a stubby lever which also locks the centre differential when tackling really though conditions. Solihull's styling team received the ultimate accolade when a Range Rover was selected as "an outstanding example of modern sculpture" for an exhibition at the Louvre, the world-famous art gallery in Paris. But its beauty is certainly not only skin-deep. Rust-proof aluminium panels are used extensively to make the elegant, functional bodywork look good and last well. The Range Rover is admired from Badmington to Bangalore and is equally at home in Kensington High Street or Katmandu. It was launched exactly 14 years ago, in June 1970, but time has only increased its appeal. British and European sales set new records in 1983, and demand is 1984 is even stronger. More than 130.000 Range Rovers have been built since 1970 - a remarkably high figure for a vehicle of this nature. The Range Rover is virtually impossible to pin down in a few well-chosen words. As 'Motor* magazine commented in 1970; "It is too many things rolled into one for that." 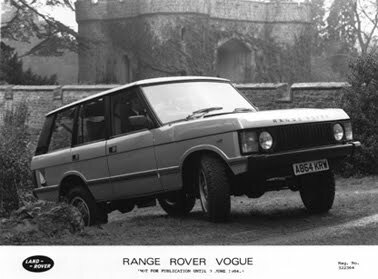 The theme was echoed in the original advertising campaign which described the Range Rover as a unique blend of luxury car, performance car, estate car and cross-country car. The same can be said today, but the world-beating concept has been developed, refined and expanded - notably since Land Rover Ltd was formed in 1978 - to increase a family with even greater appeal. The Range Rover's roots actually delve back more than 30 years, to a periode shortly after the Land Rover made its debut in 1948. In 1950-51 the old Rover company considered plugging the gap between its 4 x 4 'workhorse' and the P4 range of what would now be called executive-class saloons. The proposed new model would have to combine most of the Land Rover's all-terrain capability with more refined on-road manners. The first prototype had four-wheel drive - a conventional transmission had also been considered - and what became known as the 'Road Rover' project was given a tentative go-ahead in 1953. The vehicle was unofficially dubbed 'The Greenhouse' because of its angular body and big windows. Development work continued, but the programme was eventually abandoned in 1958. One reason was advent of a station wagon version of the land Rover. The concept was too good to die, however, and interest in the 'Road Rover' concept was revived a few years later. The dream moved a significant step closer to reality in 1965, when Rover bought the rights to a superb 3.5 litre V8 engine originally designed for Buick in the United States of America. Smooth, strong and featuring a great deal os weight-saving aluminum, it was the perfect power unit for what the company's engineers had in mind. 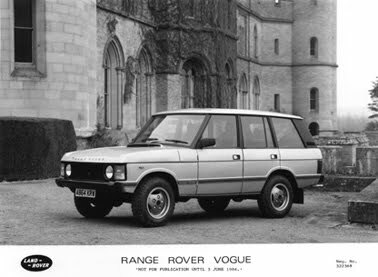 The first Range Rover prototype was completed in 1967. Its coil springs, self-levelling rear suspension, permanent four-wheel drive and wonderfully elegant, functional styling provided a rock-solid basis for all subsequent Range Rovers. Any lingering doubts about creating a market for such a bold new concept were swept aside by a tidal wave of enthusiasm and exitement in 1970. Press and public alike hailed the Range Rover as a masterpiece. It wasted no time attracting the sort of mystique proviously assosiated only with blue-blooded sports cars and the world's most exclusive limousines. The motor industry's professional pundits were equally impressed - and backed their comments with awards. In 1970, for instance, the Range Rover emerged from the Earls Court Motor Show with a gold medal for its coachwork. In the same year it also won the coveted Don Trohy and, in 1971, gained the Royal Automobile Club's Dewar Trophy for outstanding technical achievement. The only problem was trying to keep pace with orders. Demand was so great that used Range Rovers began changing hands for considerably more than their factory-fresh price. As had been so confidently predicted by its design team, the Range Rover's styling and unprecedented versatility appealed to an incredibly broad spectrum of customers. Its comfort and status, plus speed blended with the safety of four-wheel drive and four-wheel disc brakes, delighted big-mileage business executives. Farmers, foresters and estate owners welcomed the refined and standard-setting off-road performance. The high seating position and exellent all-round visibility, together with a body that is much more compact than its looks, proved ideal for shopping trips and taking children to school. I became a very trendy vehicle - perfect for transport to a fashionable golf club or weekend cottage in the country - but also proved its worth over some of the world's toughest terrain. In 1972-72, for instance, Major John Blashford-Snell and Captain Gavin Thompson of the 17th/21st Lancers organised an expedition which took two Range Rovers from Anchorage, Alaska, to the southern tip of the South American continent. The big problem was the notorious Darien Gap between Panama City and Medellin, Colombia. There were no roads, but plenty of swamps, dense jungle, snakes and hazards. The Range Rovers triumphed in the end, but conditions were so dreadful that 95 days were spent plugging the 150-mile gap. 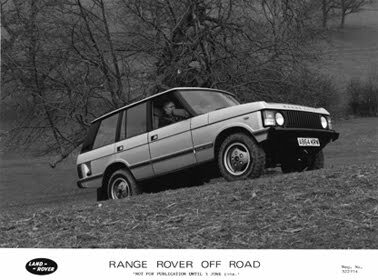 The formation of Land Rover Ltd in 1978 brought a breath of fresh air to the Range Rover's birthplace and home at Solihull, between Birmingham and Coventry. Revitalised, and still marching from strength to strength, the company set about giving the Range Rover a completely new lease of life. Sales figures still looked good, at home and abroad, but it was time to undertake some serious development work. The latest package of wide-ranging improvements is in keeping with the major advences made on a year-by-year basis since 1981, when four-door bodywork and important changes to the V8 engine were announced. Land Rover's policy of developing the Range Rover concept in this way received an important accolade in 1982. The Design Council selected it for an award for 'it's excellence in design and in recognition of an outstanding product from British industry'. The long-awaited option of automatic transmission arrived in 1982, and 1983 was marked by the advent of a smooth, precise, five-speed manual gearbox. Together with the changes announced today, 3rd June 1984, they confirm the Range Rover's status as a luxury car whose all-round excellence remain unrivalled. 1950: The old Rover cpmpany first considers bridging the gap between its stately saloon cars and the rugged Land Rover, announced two years earlier. 1953: 'Road Rover' project given tentative approval. 1965: Rover secures rights to light and powerful 3.5 litre V8 engine. Interest in possible new model revived. 1967: Completion of first Range Rover prototype with styling remarkably close to the final shape. 1970: Range Rover finally launched in June and greeted with unequivocal enthusiasm. Wins gold medal for coachwork at Earls Court Motor Show. Engineering excellence, notably permanent four-wheel drive, endorsed by Don Safety Trophy. 1971: Darien Gap expedition from Alaska to Argentina starts in December, ends midway through following year. Epic journey includes 95 days battling through 250 miles of trackless jungle. Range Rover awarded RAC's Dewar Trophy for outstanding technical merit. 1976: 'Car' magazine's hard-hitting staff test Range Rover, Land Rover, Jeep and Toyota on and off road. Conclusion; "We have still not found a vehicle to challenge the Range Rover." 1977: Unique convertible version built as gift marking HRH Queen Elizabeth's Silver Jubilee. 1981: Introduction of four-door variant and high-compression version of V8 engine. 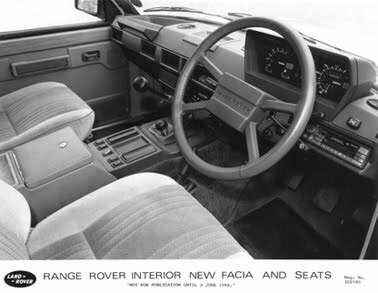 1982: Design Council award for four-door Range Rover. Introduction of optional automatic transmission with LT230R transfer box. 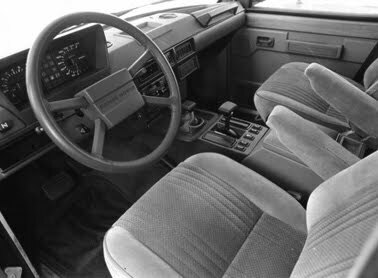 1983: Introduction of five-speed manual gearbox for even more performance and improved economy. 1984: 'Car' combines with USA-based 'Car and Driver' for extended test of Range Rover and competitors from general motors, Ford, Jeep, Mercedes-Benz and Colt in England and Wales. Conclusion; "Out of it all emerged the superiority of the Range Rover." 3 June 1984: Many improvements make Range Rover a more attractive proposition than ever.